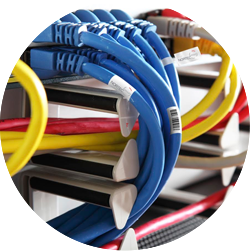 Identification of cables and wires is highly important in organizing your network and data lines. CCL Design Israel’s cable labels supplies various solutions for marking cables, wires and antennas. We offer general cables labels and flag cable labels in a variety of materials colors and sizes. Self –laminating cable labels are one of our specialties, designed to wrap easily around cables, wires and antennas and has high durability even in harsh environments. Our cable labels are manufactured using clear vinyl which wraps around to “self-laminate” the printed area of the label, on which the data or information are printed. Printing on our cable labels materials with thermal transfer printers results in durable captions while their self-laminating capability increases durability even further. These materials are highly flexible; they withstand UV therefore compatible with outside usage, and endure liquids and humidity. unique nylon cloth – recommended for use when the surface is curved or the object is round and/or flexible. Has good chemical, humidity and abrasion resistances. Matt white thermal transfer print receptive polyolefin – offers good chemical, humidity and abrasion resistance. Coated with a special cling adhesive which has excellent permanent adhesion when applied back to back and leaves no residue on other surfaces.